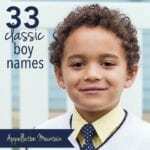 Today we’re looking at sweet spot boy names. What do I mean by sweet spot? They’re names that we all recognize, but they’re far from the Top Ten. We’ve heard them, and might even know a kid or two with the name. But they’re not everywhere – even though some of them are gaining in use. Style-wise, it’s tough to call them trendy. But you wouldn’t consider them fusty antiques, either. What makes for sweet spot boy names? As with the girls’ list, one spelling dominates. Sure, you’ll meet children called Kameryn and Gryphon, but most people will spell the names Cameron and Griffin. Sorry, Elliot and Elliott. You might not call these names classic, but all of them have a solid history of use as given names in the US. They’re not part of a name cluster, like the Aidens or the Axtons – though Aidan and Paxton might otherwise qualify. None of the names rank higher than #50, and nothing is rising too fast. For many parents, these qualities define their ideal name. If that’s you? Then sweet spot boy names is your go-to list! At first glance, it’s a nature name, borrowed straight from summertime. But August goes back eons as a given name, worn by emperors and saints in various forms. Augustine and Augustus rank in the current Top 1000, too, but it’s the simplified August that hits the sweet spot. It’s simple to spell and pronounce, instantly familiar to everyone. And yet it remains just slightly surprising. Augie and Gus both make friendly nickname options. Read more about August here. Axel sounds trendy and tough, but it’s actually the Scandinavian form of the Biblical Absalom – my father is peace, one of King David’s sons in the Old Testament. It makes for a nicely international pick, too, familiar throughout Europe as well as the United States. 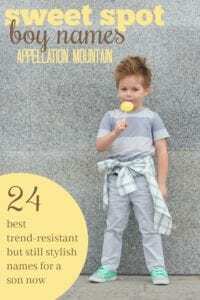 In our age of Jaxton and other creative inventions, Axel shares all their style, but with plenty of notable bearers, too. Rock star Axl Rose was born William Bailey, but he lends this name even more swagger. Read more about Axel here. A Scottish surname long used in small numbers, Cameron became a fast favorite in the 1980s. What explains the name’s rise? Cameron was Ferris’ best friend in 1986’s Ferris Bueller’s Day Off. (And Cameron’s dad owned the vintage Ferrari they borrow for the day.) Or maybe it’s down to Kirk Cameron, star of Growing Pains, which debuted in 1985. Either way, it became a white-hot, fast-rising pick for a son … and then mellowed into a familiar, friendly choice for a child. The 90s brought a brief uptick in the name’s use for girls (courtesy of Cameron Diaz), but it never quite took hold. 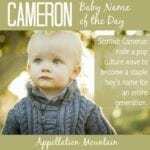 Instead, Cameron feels like a modern staple, and yes, one of the sweet spot boy names. Read more about Cameron here. There was Old King Cole and Nat King Cole and Cole Porter, but until recently, there weren’t boys called Cole, at least not as a first name. That changed beginning in the 1950s, and then Tom Cruise played a race car driver named Cole in 1990’s Days of Thunder. The sometimes-surname can also be derived from Nicholas, or an Old English name meaning dark. 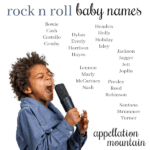 Either way, this name combines deep roots with a straightforward, stylish sound for a winning choice for a son. Read more about Cole here. From Dean Martin to James Dean, there’s something slightly mid-century about this name. Indeed, it peaked in the 1960s. But it’s never left the US Top 1000, and a handful of more recent references keep it relevant for parents today: Rory’s first boyfriend in The Gilmore Girls, and Harry’s fellow Gryffindor – and Quidditch teammate – in Harry Potter. It’s a bright, compact sound, and a name that feels instantly familiar, but not overused. A brother to reigning #1 name Emma, Emmett is found in the US Top 1000 every year since we started keeping track. 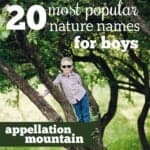 It’s more popular than ever today, part of the crop of -t ending boy names, including Beckett, Elliott, and Barrett. 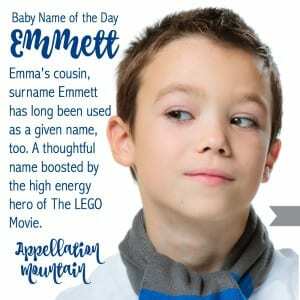 Several of them could be considered sweet spot boy names, but the honor goes to Emmett. It’s a little bit unassuming, a name with a homespun vibe. Twilight gave the name to a Tennessee-born Cullen vampire, but that only served to lift the name farther. One more pop culture reference: the hero of The LEGO Movie bears the name, too. Read more about Emmett here. Another Scottish surname, associated with the telephone (thanks to Alexander Graham Bell) and the cracker (thanks to reformer Sylvester Graham), this name doesn’t feel tied to a particular decade. Instead, it’s heard steadily throughout the years, as a first and a last. One possible complication: some pronounce it more like gray-uhm. And yet, I think this still belongs with sweet spot boy names, a straightforward choice that we’re used to hearing just enough. I’ve yet to write about Graham, but check back and I’ll update when I do. Griffin sounds gruff, but fanciful, too. Maybe that’s because of the gryphon, a mythical half-lion, half-eagle. It’s a Welsh name of debated meaning, but it’s also a common surname. It’s been a Top 1000 name since the 1980s, but it’s bounced around the low- to mid-200s since the 1990s. That feels like the very definition of a sweet spot name. Bonus? It could shorten to stylish nickname Finn, if you were so inclined. Read more about Griffin here. Jonah takes the evergreen, approachable Joe and adds some Old Testament style. With Elijah and Isaiah and Noah so in favor, Jonah fits right in. The story of Jonah and the Whale might appeal to parents of faith, and the connection to the ocean could also motivate some to consider this name. One more nature name tie: Jonah comes from a Hebrew word meaning dove. It’s appeared in the US Top 1000 every year since 1970, and has ranked in the Top 200 since the 1990s. Read more about Jonah here. When it comes to names related to John, Jackson is the most popular member today, followed closely by Jack. But Jonathan has potential. It fits with longer boys’ names, like Alexander and Sebastian. Nickname options abound. (Well beyond Johnny! How about Jono or Nate?) And notable Jonathans are plentiful, too, like Harker, he who faced Dracula, or author Jonathan Swift, of Gulliver’s Travels fame. Jude might be the best known boys’ name in a song, thanks to The Beatles. It took Jude Law to take it from obscure to mainstream, and today it’s a well-established choice. It feels traditional but sounds modern, and while it’s risen in use substantially, it remains relatively underused. Jude has bounced around the mid-100s since 2010, which puts it right in line with sweet spot boy names. Read more about Jude here. Boy names ending with -o are wildly stylish today. Some, like Leo, feel vintage. Others, like Arlo and Milo, have history of their own, but seem more like modern innovations. File Hugo in the same camp as Leo, We know we’ve seen this one in the history books. It’s instantly familiar, but surprisingly seldom heard. The meaning is just perfect: it comes from a Germanic word meaning spirit or heart. As a bonus, there’s a sweet song from the Broadway musical Bye, Bye Birdie that features the name. Read more about Hugo here. Short and strong, Kai makes for a culture-spanning choice. 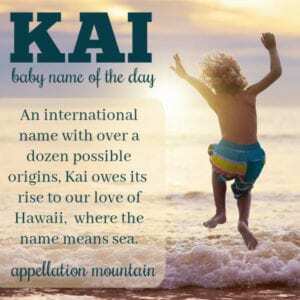 It comes from the Hawaiian word for ocean, but Chinese and German-Scandinavian origins exist, too. There’s also a plausible tie to Arthurian legend. Perhaps most importantly, Kai succeeds on sound, picking up where Ryan and Kyle left off, a choice more 21st century than cowboy-cool Ty. Despite being little used until the 1980s, Kai feels like a modern traditional now, a name steadily ranking in the US Top 200 since 2010. Lane started out as a surname for someone who lived near a path; but today it feels like a name that’s at home in wide open spaces. A little Western and a little bit sophisticated, Lane could appeal to parents from many walks of life. It was used in small numbers for years, but got a big boost from the 1994 movie 8 Seconds. The movie was based on the life of Lane Frost, a champion bull rider who died in the arena in 1989. That’s the country cool vibe; but it also sounds right when Mad Men introduces a proper Englishman by the name Lane Pryce. I’ve yet to write about Lane; check back and I’ll update when I do. M is letter of Michael and Matthew, solid perpetual favorites, as well as newcomers like Mason and all of those many Max names. But somehow, Malcolm is one of those solid, respectable M names perpetually overlooked. Worn by kings in Scotland and Malcolm X in the US, I thought it might catch on after expert namer Joss Whedon gave the world anti-hero Malcolm “Mal” Reynolds in Firefly. So far, though Malcolm has never cracked the Top 200 – or left the Top 1000. It’s the perfect under-the-radar choice. 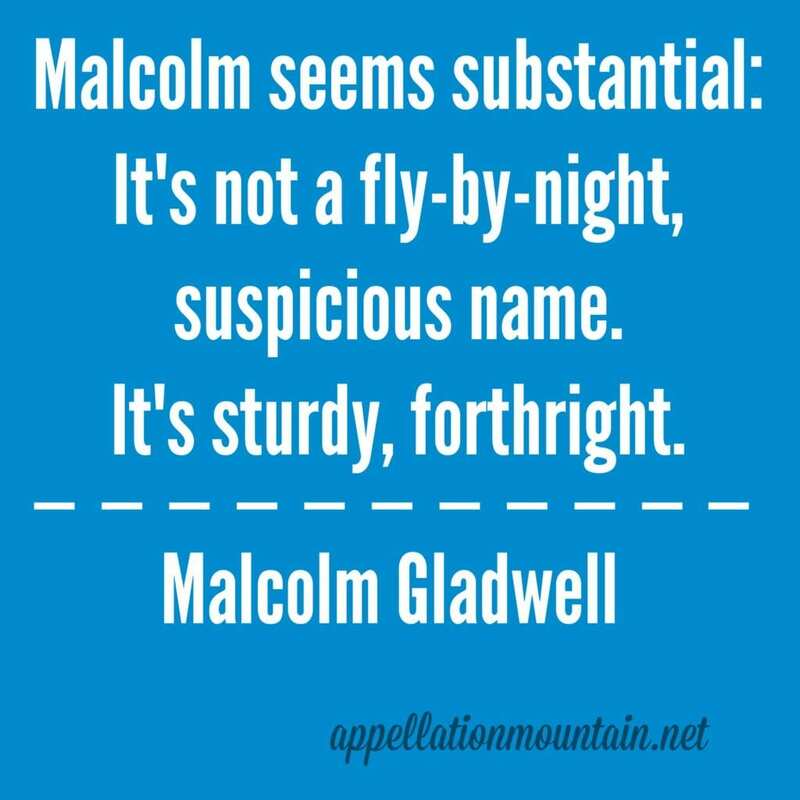 This quote from journalist Malcolm Gladwell sums up the name’s appeal nicely. I’ve mentioned o-ending boy names elsewhere in this post, but here’s another one that fits with sweet spot boy names: Marco. Matteo might make this list, but is it one-t or two? Instead, let’s look at romance language Marco. It’s a brother for Luna, a name less expected than Leo. My favorite Marco fact? He’s the boy in two Dr. Seuss stories, To Think That I Saw it on Mulberry Street and McElligot’s Pool. Seuss based the character on a colleague’s son. It’s an o-ending boy’s name that feels traditional, rather than trending. Like Lane, Marshall feels at home in the Wild West. But, of course, a marshal was a law man with a badge. Think Wyatt Earp. It started out as an occupational surname for one responsible for horses, though the title might attach to someone whose role was rather humble, or quite mighty. Today it feels like capable, familiar, and yet it’s relatively uncommon. Rapper Eminem was born Marshall Mathers, and uses the name in his work, but that wasn’t enough to spark a revival. Instead, Marshall cruises along, fitting in with plenty of stylish surname picks but remaining relatively rare. Miles combines a sort of colonial vibe – Myles Standish sailed aboard the Mayflower Plymouth Rock – with all the jazz-fueled cool of Miles Davis. I love the idea of Miles as a name for a runner’s son, too. Like Malcolm, it’s an M name, one that feels midway between the hyper-traditional and the oh-so modern. That makes it among the perfect sweet spot boy names. Yes, there’s the green, garbage can-dwelling Sesame Street character. And sure, it’s a brand of hot dogs with a catchy jingle. 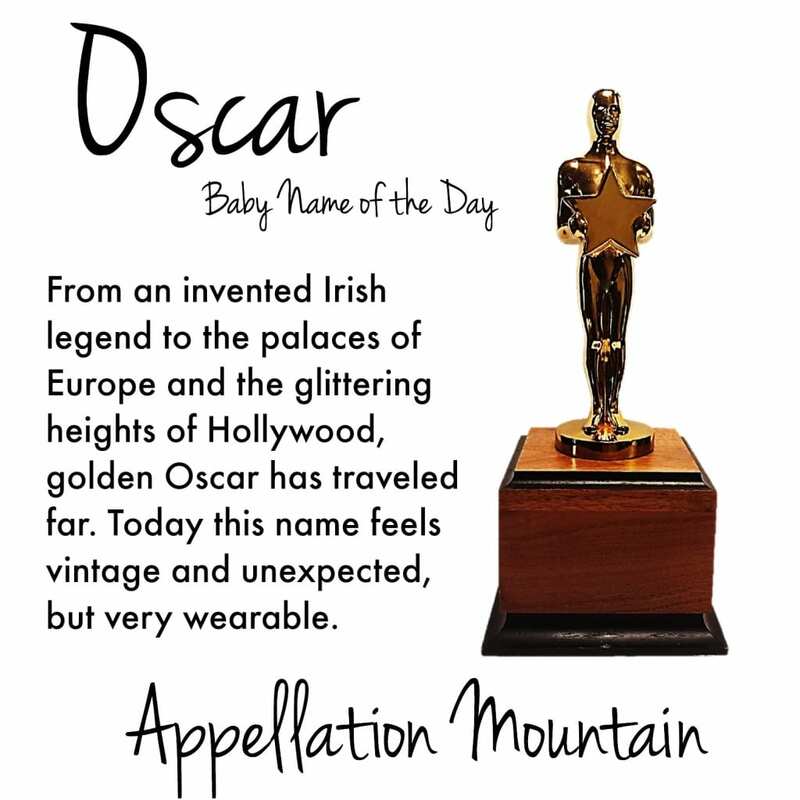 But more than that, Oscar is a name from Irish legend, one that likely came to Ireland by way of the Vikings. Napoleon so admired poetry about Oscar that one of his godsons was given the name. That godson later ruled Sweden as King Oscar I, returning the name to its Scandi roots and making it royal. The Academy Awards statue bears the name, lending it some Hollywood glam. Today it’s a global favorite. Read more about Oscar here. There’s a sixth century saint Romanos, so you can’t argue that this one is novel. But it took a soap opera to transform Roman from a name long-used in small numbers to one that plenty of parents put on their shortlists. The years was 1981, and the soap? Days of Our Lives. It’s climbed steadily ever since. 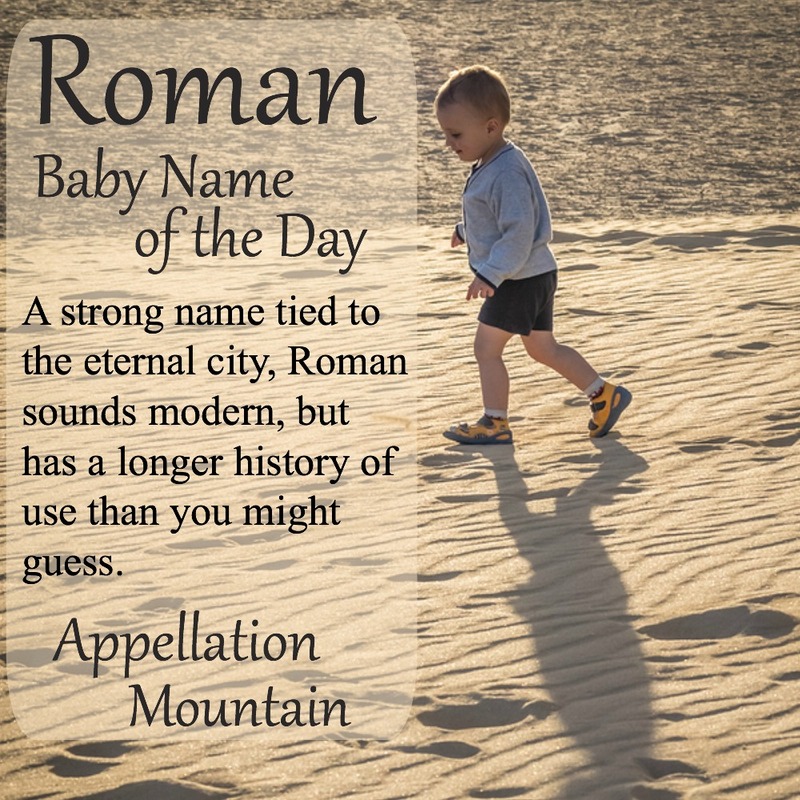 It simply refers to someone from Rome, it benefits from our affection for place names, too. And the strong sound stands up nicely to popular choices like Aiden and Mason. Read more about Roman here. Silas sits on the verge of Top 100. The New Testament name feels literary – as in George Eliot’s Silas Mariner – and stylish, too. 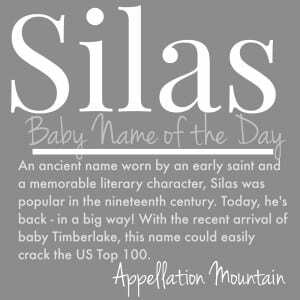 It counts as a nature name, a subtle one, because it comes from the Latin Silvanus, from silva – forest. It had faded slightly, but then Justin Timberlake and Jessica Biel gave the name to their firstborn in 2015. He’s often in the spotlight; in fact, the little Timberlake inspired the name of dad’s new album, Man of the Woods. Despite all that attention, though, I think it still hits the sweet spot. The Greek form of a Hebrew name, New Testament Simon sounds smart and traditional – but not too common. In England, it was big a few decades back. But in the US, it’s always hovered between the Top 200 and Top 600. That makes it the kind of name that everyone knows, but few people share. Another bonus? Simon shares the two-syllable, ends-in-n construction of so many mainstream favorites, without sounding like one of the crowd. Wesley has never left the US Top 1000. It might be a spiritually significant name, honoring theologian John Wesley. It could be a nod to cult favorite The Princess Bride’s Westley. Actor Snipes makes it cool, even edgy; Wes Anderson makes it independent and quirky. It’s tough to pin down this name, one that fits with traditional favorites like Calvin and Henry, but also modern choices like Mason and Bentley. But that’s good news, because that shape-shifter quality is often exactly what parents seek. Read more about Wesley here. The Z makes this name instantly a little cooler, as does author Zane Grey, known for his tales of the American frontier. But it still falls of the right side of classic; it’s sometimes associated with Alexander, or even John. Popular animated series Lego Ninjago gives the name to the ninja who wears white – yet another reason the name might appeal to the 12-and-under set. 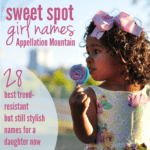 It straddles the classic and cool categories, a very wearable sweet spot boy name. Read more about Zane here. Those are my picks for the sweet spot boy names! What would you add to the list? Dean Winchester should definitely get a mention here considering Supernatural’s impact on baby names in the US. So many great names here. Axel and Silas might be my faves. I’m so confused – how would you pronounce Graham/Graeme except Gray-um? Maybe it’s some kind of transatlantic pronunciation black hole because I’m in the UK but I can’t even work out another way you’d say it . Help! I’ve never heard the “Gray-um” pronunciation. I’m front a mid-Atlantic state and have lived in the mid-west, east coast and the south. I say and hear “Gram”. I wouldn’t be surprised to hear “Gray-um” where I live now but I would find it odd. @Cece, a Canadian here to agree with your general message of “say what now?!”. I’ve never even considered that this could be anything other than Gray-um. I think the second syllable of this name must disappear at the US border.